It makes great steak, though. Smart cooking gadgets are de rigueur these days. We've seen connected sous vide machines, smart kitchen scales and even a WiFi slow cooker. 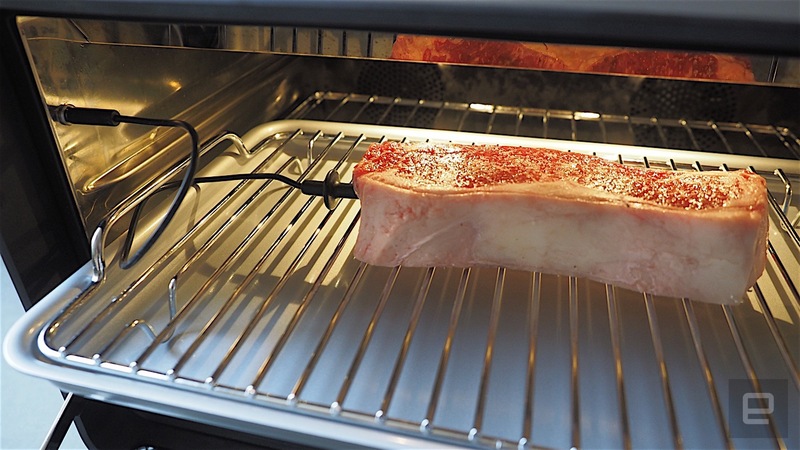 So you'd be forgiven if you thought a smart oven would be just another appliance with an app. The June smart oven, however, is a lot more than that. It's outfitted with an HD camera, a 5-inch touchscreen, a slew of sensors and even a 2.3 GHz quad-core NVIDIA CPU, all for the purpose of taking the guesswork out of cooking. And after three years of development, the company is finally starting to ship to preorder customers next month. The downside: It costs $1,495. And while I think it's a wonderful machine, that's still much too rich for my blood. One of the first things you'll notice about the June is its size. At 22 inches wide, 13 inches tall and 18 inches deep, it's about the size of a large microwave or a supersize toaster oven. In other words, it's big. It'll take up quite a bit of counter space, which is a problem if you have a small kitchen. At the same time, this size also means a relatively large capacity. The oven has a 1-cubic-foot cavity, which is big enough for 9-by-13-inch baking sheets or 11-by-16-inch casserole dishes. You could easily roast a three-pound chicken in it, though it's much too small for a turkey. The June Oven comes with a ceramic-silicone nonstick pan plus a roasting rack. The exterior housing is made of cold-rolled steel with a metallic silver finish that stays surprisingly cool to the touch even at extreme temperatures. As for the door, it's actually made of three panes of edge-to-edge glass, two of which are triple-glazed and thermally coated to keep the heat in. The front glass is home to a 5-inch touchscreen, which sits above a gleaming steel knob that rotates and clicks. On top of the oven is a periphery of perforated steel for ventilation. There are also load cells in each foot of the oven, so you can use the top of it as a scale. Overall, the oven's glass-and-steel construction makes for a high-end modern design that would look great in any kitchen. That level of sophistication carries to the interior of the oven. On the rear are two convection fans that speed up cooking. Two high-power white LEDs illuminate the inside, while the heating elements comprise four 450-watt carbon-fiber broiling elements on the top and two 450-watt carbon-fiber baking elements on the bottom. These carbon-fiber elements result in what June is calling "instant on" heating, which is the ability for the oven to achieve the desired temperature at rapid speed. In my experience, this turned out to be true. It preheated to 400 degrees in just under five minutes, which is way faster than what my oven range can do. 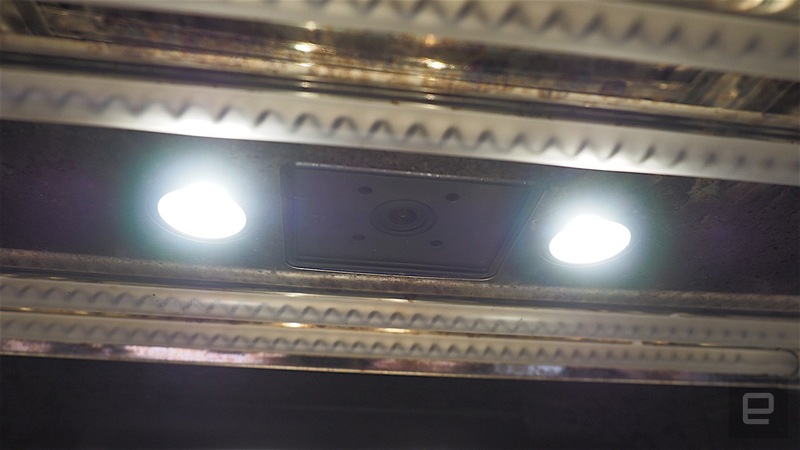 Built into the ceiling of the oven is an HD camera, which is used not only for food identification but as a way to transmit live video of your culinary creation to your phone. Also on either side of the camera's interior are two slots that you would use with an accompanying thermometer probe, which promises to ensure perfectly cooked meats and seafood. All of the other components, like the CPU (the NVIDIA Tegra K1 2.3GHz quad-core ARM Cortex-A15), GPU (192 NVIDIA CUDA cores) and RAM (2GB DDR3), are housed in the oven's rear. When you first plug the oven in, the touchscreen display on the front will prompt you to connect it to the local WiFi network. After you do that, it'll download the latest software updates and then prompt you again to connect the oven to the June companion app via Bluetooth. 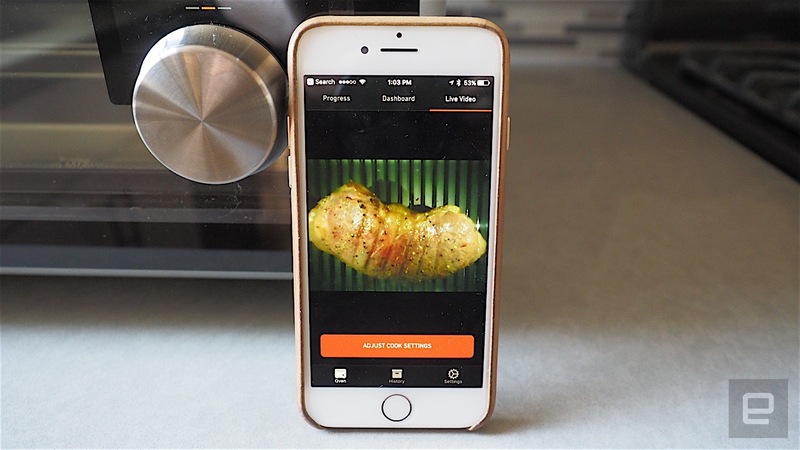 The app is used mostly to monitor your food as it's cooking, but you can also use it to preheat the oven ahead of time and adjust cooking time and temperatures on the fly. My favorite thing about the app is the ability to use it as remote timer; you'll be able to know that your food is done even if you're on the other side of the house. Once that's done, the oven is finally ready to go. 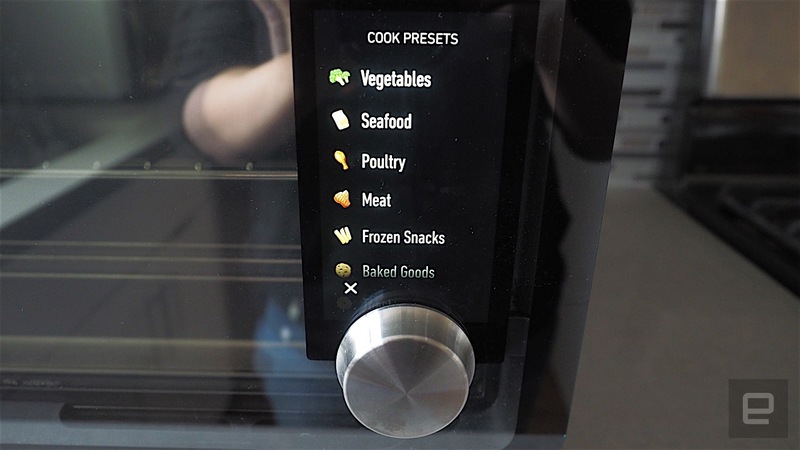 You can use either the touchscreen or the click-knob to navigate through the menu, which consists of a variety of presets as well as functions that include roasting, baking, broiling, toasting and reheating. Roasting turns both the top and bottom heating elements on, baking engages just the bottom, while broiling starts just the top. You can adjust the temperature, the timer and, if you're making toast, the desired level of doneness. The presets, however, are what make the June so unique. At the time of testing, there are around 25 preset cooking programs for foods such as bacon, beef, chicken, broccoli, toast, bagels, cookies, waffles and chicken nuggets. These presets work in concert with June's HD camera and "Food ID" technology that instantly recognizes the food when you put it in the oven. As soon as I placed two frozen waffles in the oven, for example, it immediately popped up a waffle icon on the touchscreen. I tapped the icon, and I saw that it recognized that I was making two waffles, not just one. Then I hit the "Start cooking" button, and it did so without me having to preheat the oven or input any temperature or timer settings. After a few minutes, they were done, toasted to perfection. My favorite food that I've made in the June was definitely steak. I placed a piece of New York strip steak in the oven and, just as with the waffle, the device instantly knew what I was cooking. I clicked the steak icon and it asked me what doneness I wanted it to be. I selected medium-rare (of course), and I was instructed to put the thermometer probe in the center of the meat, which I did. I placed the steak on the roasting rack and inserted the other end into one of the temperature slots inside the oven. I pressed "Start cooking," and then the magic started. First, the oven went into a high-temperature 500-degree broil mode, blasting the meat with intense heat. At around the 12-minute mark, the oven (and the accompanying app) beeped, prompting me to flip the steak over. 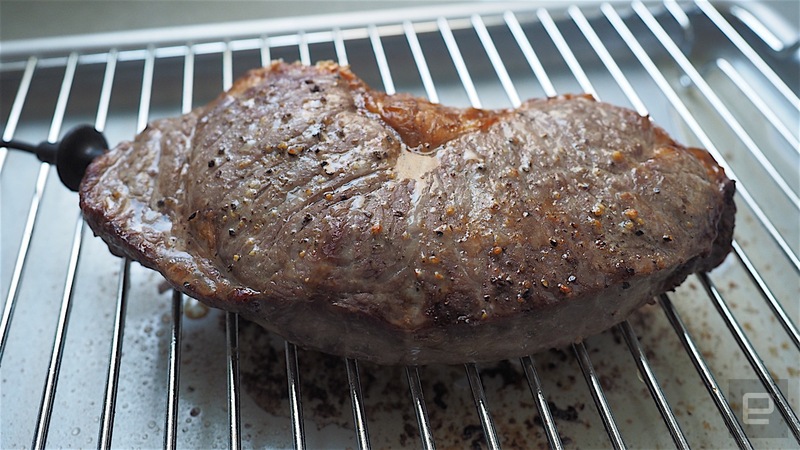 Then the oven switched to a 250-degree roast mode, cooking the steak low-and-slow until a certain internal temperature was reached. After that, the oven went into the broiling stage again, searing the other side. Once the internal temp hit around 128 degrees, the steak was finally done. I let the steak rest for a few minutes and then sliced into it eagerly. The steak was reddish pink in the middle and perfectly medium rare. It was absolutely delicious. And it took all of 20 minutes. I did hit a few snags with Food ID, however. For one thing, not all of the presets recognize food quantity. With bacon, for example, it didn't ask me how many rashers I wanted to cook; it just started cooking after I hit OK. After about 20 minutes, my single piece of bacon turned out so crispy it was almost burnt. It also misjudged the level of doneness that I wanted a piece of toast; even though I indicated "Medium" in the toast preset, the result was more of an inedible "Dark." I asked June about this discrepancy, and the company said it was largely because I was testing a beta unit, meaning it's possible I ran into a temperature-calibration issue. The company also said that with the bacon, the preset assumes you're making four to six slices of bacon, not just one, so the cooking time wasn't accurate. In the future, June could have a warning that says, hey, if you're putting in less or more than the recommended amount, you should watch the oven more closely to make sure the food is done to your liking. Matt Van Horn, June's co-founder, tells me that the company plans to add "object counting" in Food ID so that the device will know how much bacon I have in the oven and adjust the cooking time appropriately. In any case, June says that bugs like these can be fixed easily via a software update. 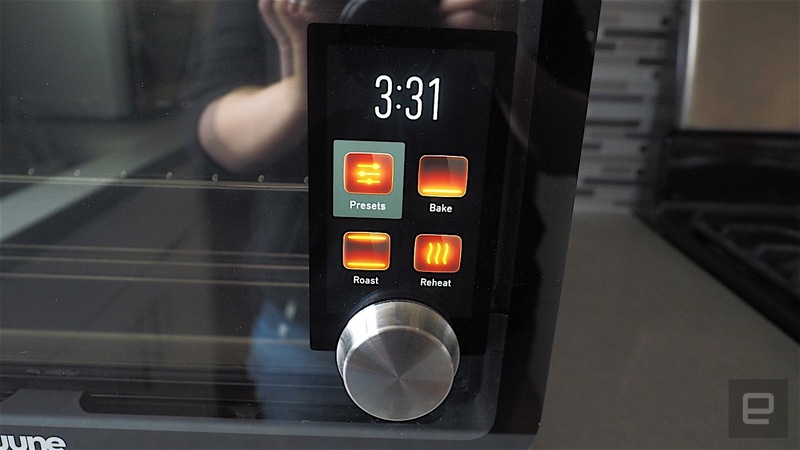 Indeed, the fact that the June is basically a computer masquerading as an oven means it can be updated with new features over time. This, Van Horn said, is the power of the June, and why it's so much better than the competition. "Other appliances get worse over time," he said. "Ours gets better." In the short term, that means bug fixes. But in the long term, that would mean even more food presets. The more people cook with the June, said Van Horn, the more information it gathers about the kinds of foods its customers want to eat. I've had the June for a few days now, and I can say that I'm incredibly impressed by it. It's so much more versatile than a traditional toaster oven, and it's vastly more efficient than my existing gas oven. I can see myself using the June over my actual oven range for 90 percent of my cooking because it's just so much faster and easier. It's because of this that I can overlook the few bugs that I encountered. But that price is just way too steep for me. June recognizes this, too, and says it's implementing a zero-percent-interest financing program that allows consumers to pay $150 a month until the oven is paid off. Even so, I just can't commit to it. I already have an oven, and I already have a toaster. If I wanted temperature precision, I can buy a standalone probe thermometer for about $20. 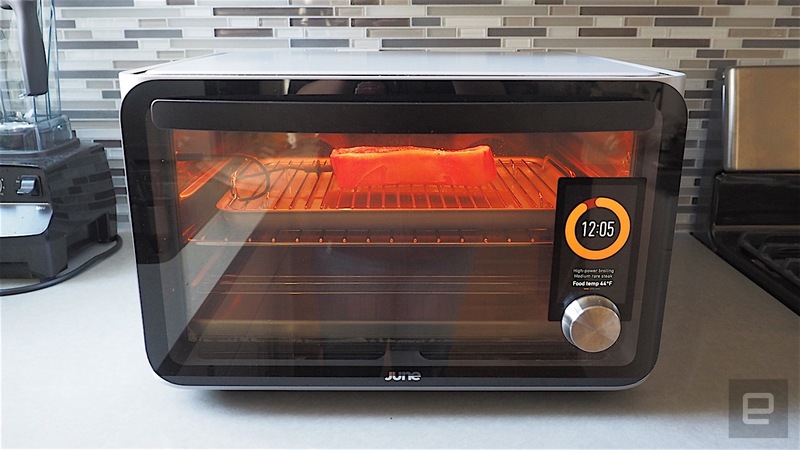 Yes, the June is quite possibly the smartest oven you'll ever use. If you have $1,500 to spare, go right ahead and get it -- I think it works well and has a lot of promise. But for most of you, I suggest sticking with the oven you already have.